Varla Ventura, Coast to Coast favorite, Weird News blogger on Huffington Post, and author of The Book of the Bizarre and Beyond Bizarre, introduces Weiser Books new Collection of forgotten occult classics. Paranormal Parlor is an eerie assemblage of affordable digital editions, curated with Varlas sixth sense for tales of the weird and unusual. In the 1859 Christmas edition of his regular publication, All Year Round, Charles Dickens solicited his favorite authors to take up residence in his Haunted House. 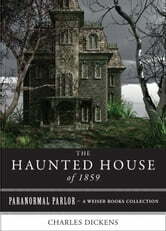 With an introductory story by Dickens (The Mortals in the House) each author writes from the point of view of the ghost residing in a room. On the Twelfth Night of Christmas, a night believed to hold supernatural powers, the ghost begin to speak. Adelaide Anne Procter, who was Queen Victorias favorite poet, delivers the tale of The Ghost in the Picture Room entirely in rhyming verse. Wilkie Collins, a lifelong friend of Dickens and a well known author and playwright, delights with his nautical story of The Ghost in the Cupboard Room. And Elizabeth Gaskell, in the longest of the stories in the collection, paints a vivid portrait of the ghost of a judge in The Ghost in the Garden Room. For any lover of Dickens, Gaskell, or even just a good ghost story, this unique collection will warm the heart and chill the bones.